Our main course is the Yacht and Small Craft Survey Course. This provides practical training in the skills and techniques needed to survey small craft. The first two weeks cover GRP and steel vessels and are followed by a week's private study and directed learning, then a further two weeks are spent on small craft systems, rigs and engineering. The course is very intensive and we have found this break to be essential. With two tutors on the course and a maximum of eight delegates we ensure every individual receives intensive practical tuition. Most of this takes place out of the classroom aboard a large variety of boats under actual survey conditions. We also have strong links with Foxs boatyard, using their engineering, rigging and GRP workshops to demonstrate typical repairs, and with Foxs Yacht Sales which allows us access to a wide range of pleasure craft. We also work with Oyster Marine, Gunfleet Yachts and a wide variety of local repair yards. If you have the appropriate background, this course bridges the gap between the study of theory and actually starting work and in that respect it is unique in the world. Many new surveyors qualify by following distance-learning courses with a minimum of quality practical tuition but this course offers more practical experience in identifying and quantifying defects than may be gleaned in many years of normal surveying practice. Preparing a factual survey report which is fit for purpose is as important as the survey itself and this is also taught in a structured manageable manner as the course progresses using our knowledge of the standards expected by the main surveying associations. About 100 hours of preliminary study is needed using modules we supply along with detailed reading lists. Each delegate is assessed for their technical knowledge at the outset of the course and at frequent intervals thereafter with practice surveys after the second and third weeks, and a final survey exam at the end of the course on which the candidates final mark is assessed. If necessary we tailor parts of the course to suit different skills sets - surveying is very much a blend of practical boatbuilding, problem solving and report writing which is a rare mix but part of what makes it one of the most diverse and satisfying jobs in the marine industry. Participants should have experience of maintaining and operating small craft, or have relevant backgrounds in the marine industry. Typical backgrounds are marine engineers, boat builders, Royal and Merchant Navy personnel, RNLI inspectors, world cruisers and super yacht crew. There is no prescribed list and we will advise delegates on where we think they might gain additional experience before starting. By the end of the course, delegates should be able to carry out pre-purchase and insurance surveys on GRP and steel yachts and work boats. They will also know how to carry out tonnage registration surveys (and if successful be authorised to carry these out on behalf of YDSA), and understand how to carry out MCA Coding inspections. Most of the course is held in the Ipswich area and delegates typically stay in local guesthouses, bed and breakfasts, short-term rentals or even aboard their own yachts in one of the local marinas. We can provide an accommodation list. The optional "Introduction to Surveying Wooden Boats"is held once a year and is a five day course designed for those who have completed the full survey course wishing to extend their knowledge or for wooden boat owners and restorers. It is most suited to those who have some background with wooden boat construction. It is also useful for those who do not intend to survey wooden vessels as they may encounter many steel and GRP vessels with timber decks and superstructures. 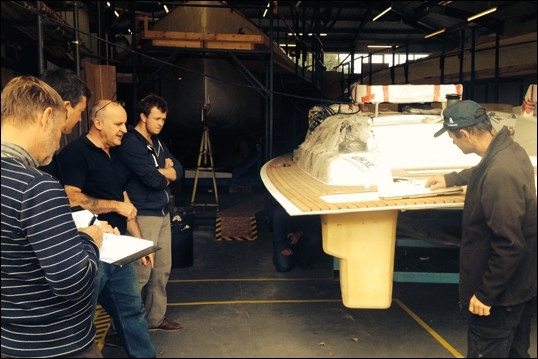 The course is delivered by surveyors who have many years experience with wooden boatbuilding and ownership. The course involves travel to other locations to make the most of the vessels available at the time of each course. It follows a more informal format than the main course; there is no survey exam to undertake nor any assessment and delegates should be able to cope without evening study. A certificate of attendance will be issued and the course attracts CPD points from all the survey organisations. The course aims to prioritise the most common defects found in the various types of timber vessels, and to demonstrate the investigative techniques used to identify such defects. Finally we provide bespoke courses to government officials (e.g. coastguards, navies, security and defence contractors) on demand using the facilities and contacts we have built from our main surveying courses. The course is designed for marine industry professionals wishing to study how to survey yachts and small craft. The course concentrates on surveying and testing techniques, general principles of assessment and guidance on reporting in relation to FRP and metal craft. Shorter specialist courses are also held on wooden vessels and MCA coding of commercial vessels. Delegates should have past experience in yacht and small craft manufacturing and repair, or in marine engineering, or in related trades such as charter yacht management, or as professional seafarers. They should particularly have a good working knowledge of operating and maintaining leisure yachts or small commercial vessels. Delegates should also have a good knowledge of word processing software and be familiar with technical report writing. Delegates are sent detailed course modules which describe practical surveying techniques and are expected to have studied these before the course starts. Prospective delegates are welcome to visit the course and 'sit in' on a session. A series of tests and report writing exercises will be given throughout the course to enable us to assess progress and tailor individual sessions accordingly. 1. The role of the surveyor, survey principles and legal obligations. The survey checklist. 2. Tools and instruments, hand tools, moisture meters, ultrasonic thickness meters. 3. FRP properties, manufacture, structures and processes. 4. FRP construction and surveying practical sessions at local yards. 5. The Recreational Craft Directive and CE marking. Registering boats and tonnage surveys. 6. Keels, structures and reinforcements, practical. 7. FRP faults, osmosis, delamination and other moulding problems. 11. Local yard practical sessions, FRP damages. 19. Hull design, types. Yacht stability and resistance. 24. Brokers ­ the sellers perspective. Following the intensive first two weeks, delegates are given time for home study to consolidate what they have seen and learnt, to write up a partial survey report and to practice with tools and techniques. 38. Set up final survey exam, initial assessment and selection of boats. 39. Survey exams - final practical surveying exercise.